First off, as of today, according to Hit Tracker, Yankee Stadium has approximately 3.60 home runs a game. That puts it at easily the most HRs per game, .70 ahead of any other park. So yes, we’re all aware of the barrage of shots that have been leaving the new park. That’s not disputed. What’s wondered is why the stadium is so conductive of these home runs. Well, one thought is the following. When the New Yankee Stadium first opened, its field was much heralded as one with the same dimensions as the Old Yankee Stadium. The bullpen placements were the same, and only was the backstop a little closer to home plate. But as we are now, with 29 games played at home under the collective Yankee belt, it has become apparent that the dimensions aren’t the same in other places as well. The first graphic is from HIt Tracker, and it marks where home runs have fallen in the new park. The second graphic above shows you the outfield walls, the blue line being that of the New Stadium, the red line being that of the old one. It is immediately apparent that centerfield is deeper in the new park, but it is also immediately apparent that in right field – the destination for a majority of the HRs at the New Stadium – the wall is shallower and less curved than at the old one. If you compare the two given graphics, it’s noticeable that a considerable amount of the home runs marked on the Hit Tracker graphic have fallen behind what is now the right field wall, but could have fallen potentially in front of the old right field wall. 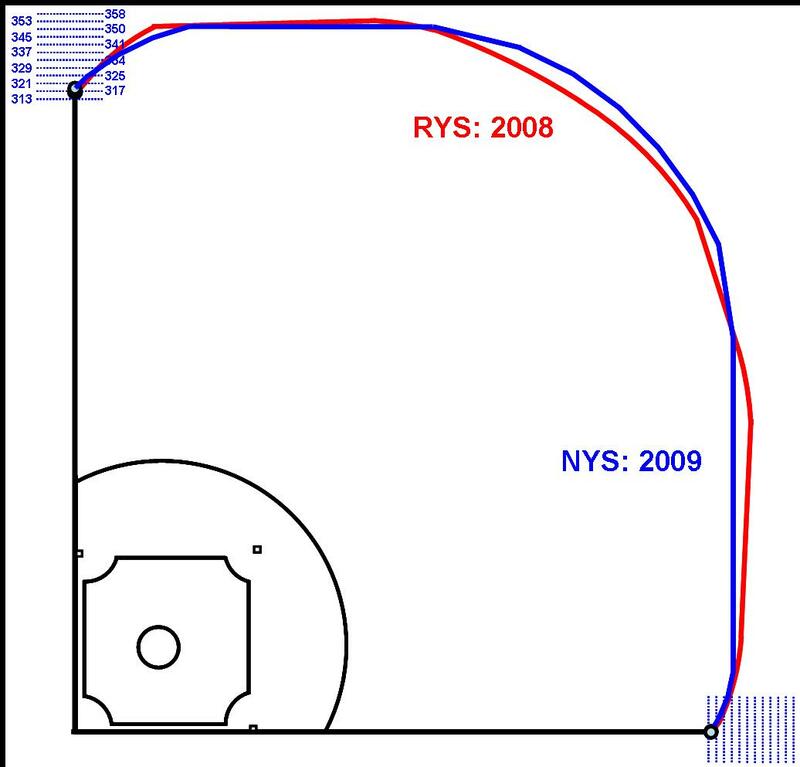 The flaw in the wall is the following: Note in the HIt Tracker graphic that a majority of the home runs hit to right are shallower than 350 feet. Those hits, at such a short distance, simply would not be home runs in any other park, including Coors and Arlington. 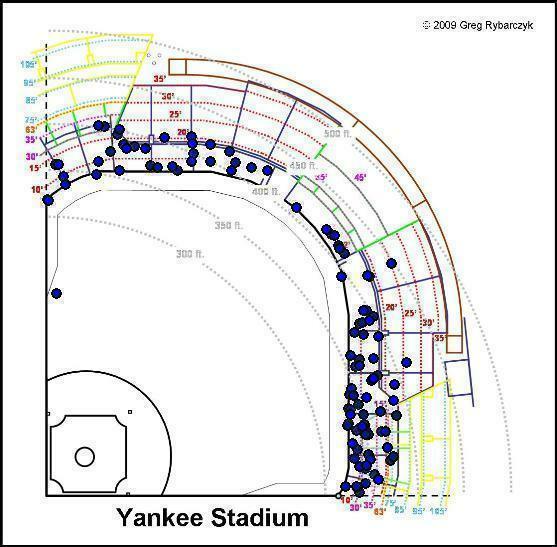 So with that, the question is: Would those less-than-350-feet hits be home runs in the Old Yankee Stadium? If so, then why are there so many more? Anyway, to lighten the spirits, here’s a graphic of Teixeira’s bombs. Mark Teixeira has been hitting his shots beyond any fence in baseball. The farther right, the further past the wall he hits ’em.